We are a volunteer-led organization and 100% of funds raised are used to enhance our children’s education and enrichment, and to fill in gaps where there have been budget cuts or underfunding. See below for details on ways we plan to further the mission of the PTA through support of our students, teachers, staff, and McDonald Int'l community. If you'd like to get involved with PTA activities be sure to check out our volunteer opportunities. 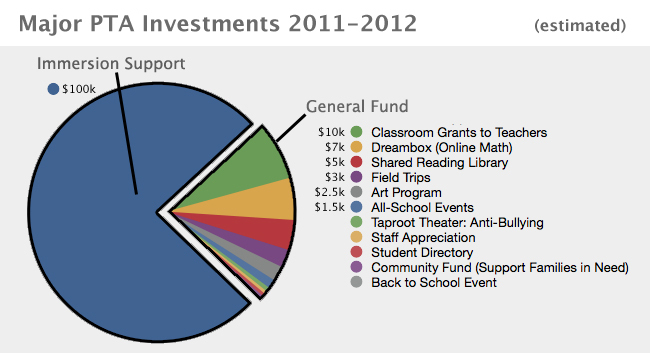 There are two funding categories: the Immersion Support (IS) Fund which pays for Immersion Support in the classroom, and the Student Support & Outreach (SSO) Fund which pays for everything else funded by the PTA. This year, our school will consist of almost 500 kids (up from 89 in 2010-11, 190 in 2011-12, 300 in 2012-13, and more than 400 in 2013-14). *this number doesn't include items like the bulk purchasing program for back to school supplies or Kids Co. childcare at some events, which pay for themselves through direct donations as they're going on. Full details of the latest budget as approved by the PTA membership can be downloaded above.